At the start of this morning’s reading, the “Jews” – meaning representatives of the High Council – told the Romans they did not want the bodies of Jesus and the two thieves left hanging there. To leave them in plain view would detract from the holiness of the Sabbath. The bodies would be unsightly, inconvenient, … and troubling. In other words, Caiaphas and the High Council wanted nothing to do with Jesus any more. They wanted the Romans to clean up the mess. Something done by people throughout history is the act of identifying and claiming the bodies of our deceased loved ones. But this troublesome dead prophet was not loved by the High Council – not worth claiming, and not worth a decent burial. As far as they were concerned, there was no kinship, no ties linking them to Jesus. Now, the Romans were not known for their sentimentality. In Roman eyes, Jesus was simply another dead Jew, and a convict at that. They might have cremated the remains, as was typical back then for non-Jews; but more likely they would have taken the body and – literally – thrown it on a dung heap in the Kidron Valley nearby, to eventually be burned along with the rest of the trash. This reaffirms what we learned in the story of Jesus being anointed with Spikenard in last week’s “Message for All Ages”: The value of Jesus and his ministry was not understood, let alone appreciated, by those in power, or even by many close to him. In their eyes, the challenges of the day and the things of this world mattered far more than Jesus’ life, or the life of any human being for that matter. If the wishes of the High Council had been followed, no one would have claimed Jesus as their own. They wanted that body to disappear and Jesus to be forgotten. Salvation would have been rejected even before God made it manifest in the resurrection. But then we have Joseph and Nicodemus. Both were believers in secret, not daring to reveal their faith because doing so would cost them dearly, starting with their positions on the High Council. Like Peter and the disciples in last week’s message, they too must have felt the pain of loss and grief of failure. They probably wished they could have stopped his death; and may have tried, but failed. Perhaps letting fear for their own safety and positions, and the safety of their families, overwhelm them in that moment of crisis. In other words, they were just like us. For any of us, taking a stand on controversial issues is hard, because the cost of doing so is often very high. But in John chapter 3, on that night when Nicodemus first came to him in secret, Jesus said “Indeed, God did not send the Son into the world to condemn the world, but in order that the world might be saved through him. Those who believe in him are not condemned; but those who do not believe are condemned already … For all who do evil hate the light and do not come to the light, so that their deeds may not be exposed. But those who do what is true come to the light, so that it may be clearly seen that their deeds have been done in God.” I often think of this scripture in light of our modern concerns about the lack of transparency throughout our political and economic systems. Nicodemus must have thought a great deal about that conversation in the months since, and perhaps talked about it with his friend Joseph. “Those who believe in him are not condemned” – well, at least not condemned by God, but how about condemnation from their peers? But then again, Jesus said that those who do what is true will come to the light and their deeds will be clearly seen to have been done in God. I’m sure that Joseph and Nicodemus both witnessed the hurried late night sham of a trial that sentenced Jesus to death, which was not done in the light; and now they knew it was time to stand for what is true. These two men were compelled to do something extraordinary. They were the first to do something that every one of Jesus’ followers, including us, are called to do. Yes, they temporarily gave in to fear, tried to hide or deny the reality of that terrible event, and their own role in it – but we all do that. They felt tremendous guilt and shame for their failure, just like we would have in their shoes. But, when it was over, once they realized who they really were and what mattered to them, they stopped running, and they stopped hiding. They turned back and stood for what was true in the face of their fear. They went before Pilate and asked for the body. They claimed Jesus as one of their own, as any who shares kinship with Jesus, which we all share with him, is called upon to do. 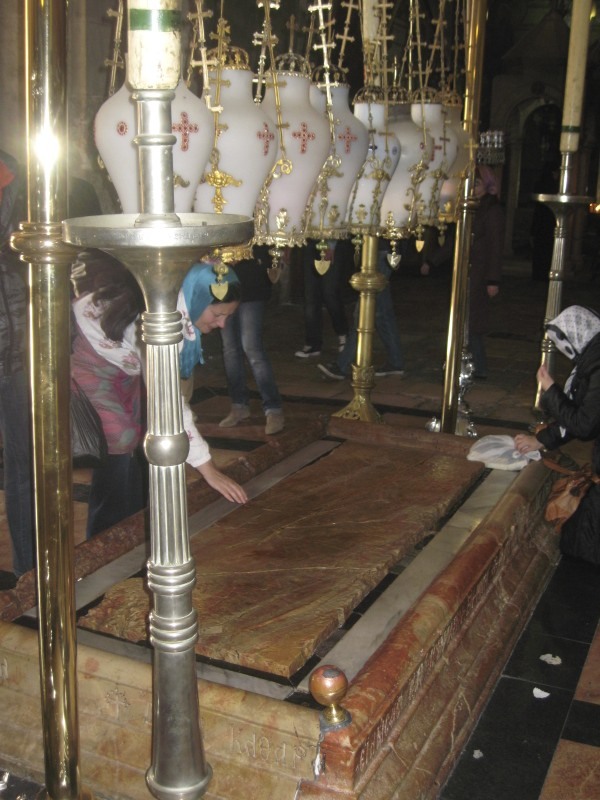 And so, in the Church of the Holy Sepulcher, and even here this morning, as we gather to finish mourning his death, and are about to encounter the revelation, joy and promise of the Empty Tomb, we are confronted by the Stone of Unction. Jesus was truly dead, his fate and his legacy, all that he had worked and stood for, lay entirely in the hands of others. He could no longer do anything for himself. He had laid down his ministry, and the only way the Gospel he preached can continue, the only way that God’s plan can be fulfilled, is if those he left behind, including us, stand for what is true. We are called act on our belief in him, show that we are not willing to let him go. We must claim him as one of our own. This is God’s tremendous gamble. 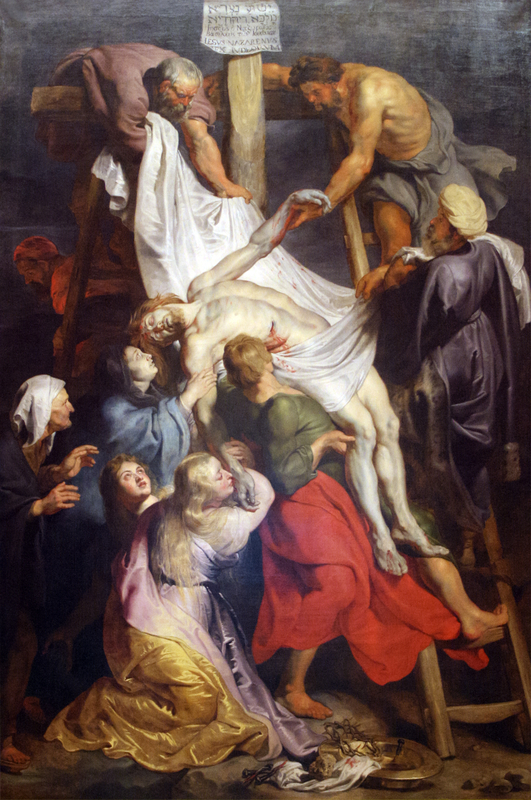 If those who believe and love Jesus do not take him down from the cross, if we do not claim Him as one of our own, the Resurrection is not ours. Salvation is offered, but would be forever unclaimed. The witness of the empty tomb would never come to pass. But I believe God’s tremendous faith in us is not fruitless. God knows we can reach past the brokenness of our existence to embrace Christ, just as Joseph and Nicodemus must have physically embraced his bloody and broken body when they took him down from the Cross as the sun set that evening, gently laying him on that cold hard stone. We know what we have to do, yet the issue is not what we know to do, but what we actually do. I imagine the body of Christ laid out on that stone, and then in the tomb, waiting for us. He was dead, but now lives again. 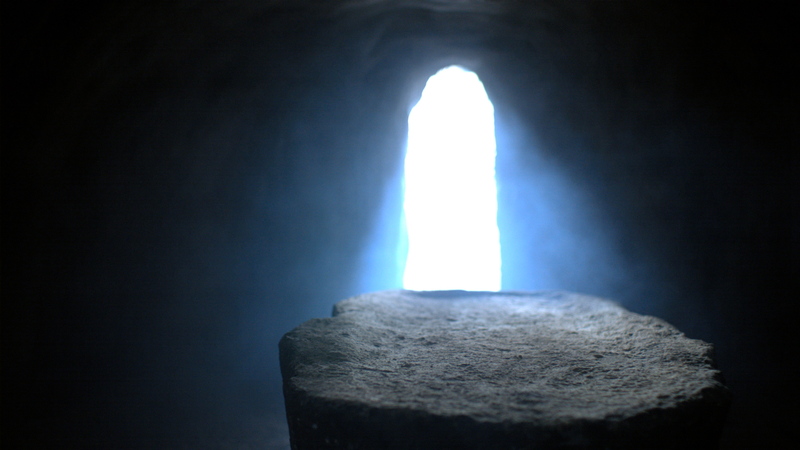 The Tomb is now empty, empty because we and God both would not let him go. We have both claimed him as our own, no longer hiding our kinship from others, no longer denying or hiding what is true. The challenge was made: Salvation was offered, and is now claimed. And so we continue the ministry and further the Kingdom of God, as we’ve been called to do, anticipating of the eventual return of our Lord and Savior. Delivered at ARK Community Church, Dalton MA, April 5, 2015 (Easter Sunday).